“I Was True (That’s Why I’m Blue).” Words by Kate Smith, music by J. Russell Robinson (1931). 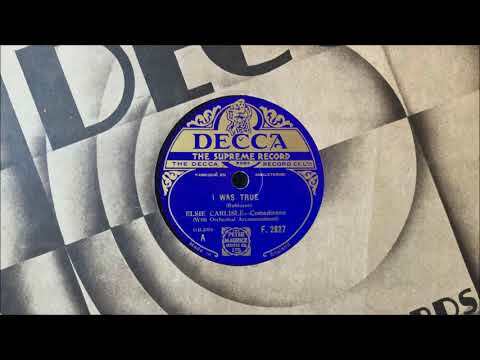 Recorded by Elsie Carlisle with orchestral accompaniment in London on February 12, 1932. Decca F. 2827 mx. GB3954-2. 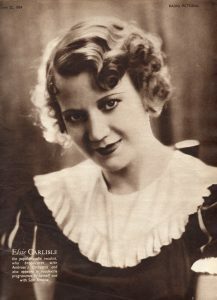 The song “I Was True” was a creation of J. Russell Robinson (a former member of the Original Dixieland Jass Band who later wrote the music for two other songs that Elsie Carlisle recorded, “Stop the Sun, Stop the Moon” and “Hold Up Your Hands”) and a certain lyricist named Kate Smith. It is possible that the latter person was the well-known singer Kate Smith, who may have occasionally penned lyrics, but I am not certain of this.1 “I Was True” describes a relationship about to dissolve due to one party’s infidelity. One could not accuse it of being a very complex or deep song, but Elsie’s version holds a certain fascination for me. It has a languid, melancholy quality that makes the repetitive lyrics mesmerizing. The studio band adds a certain elegance to a simple arrangement. Other British artists who recorded “I Was True” in 1931-1932 were Ray Noble and His New Mayfair Orchestra (v. Al Bowlly-The Three Ginx), The Savoy Hotel Orpheans (recording as The Masqueraders), Henry Hall and His Gleneagles Hotel Band (v. Maurice Elwin), and Harry Bidgood’s Broadcasters (recording as Lew Sylva and His Band; v. Sam Browne).